I've read countless Kristen Ashley books and a running theme between them all are these over-the-to alpha males who can summarize a whole sentence or action with just one word, "babe." This book does not deviate from that norm. 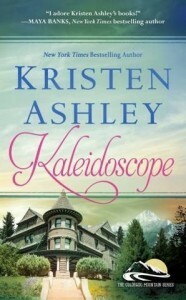 Kaleidoscopeis the sixth book in the Colorado Mountain Series by Kristen Ashley. This book is about Jacob "Deck" Decker and Emme. They've know each other for 14 years and both have a past that's not simple or neat. But there is something between them, something that hasn't gone away in the last 9 years and something Deck and Emme will fight for. The first half of Kaleidoscope blew me away. It was sweet and beautiful with moments of pure joy and happiness. 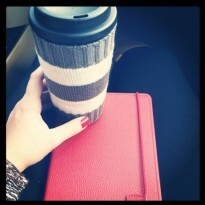 Somewhere around the middle things started to turn in the typical Kristen Ashley way. Jacob started to pull his "i'm the man" card and boss Emme around or insist that she not spend one night away from him. Now sometimes that's sweet but it became repetitive and in the end it's one of the main reasons I gave this book a lower rating. That and the ending that seemed to well just end. Although, this book is around 400 pages, the story didn't feel like it has concluded and the Epilogue come out of nowhere. Then we started jumping large chunks of time, I liked seeing where Jacob and Emme ended up I just wanted more of a story surrounding that. In conclusion, this is a solid continuation of the characters and stories we've read the past Colorado Mountain Series. We get a snapshot of how all the other characters are doing and now we add Emme and Deck to that happy family. Unfortunately there isn't anything that wow'ed me, but it was a fast engaging story at that.